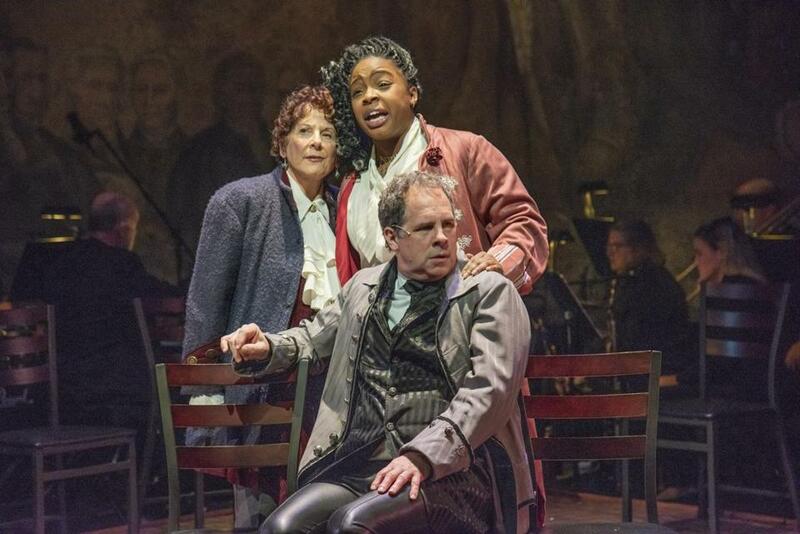 WATERTOWN — It has often been said that “Hamilton’’ is a game-changing musical, an assertion whose truth is driven inexorably home by New Repertory Theatre’s production of “1776,’’ which ends up on the losing end of that change. There’s an irony in that, because “1776’’ can be seen as a crucial forerunner to “Hamilton.’’ When it premiered on Broadway nearly a half-century ago with a book by Peter Stone and music and lyrics by Sherman Edwards, “1776’’ demonstrated it was possible to fashion a musical from America’s convulsive origins, complete with fierce conflict among rivalrous Founding Fathers who were depicted on a human rather than mythic scale. But time has not been kind to “1776.’’ Compared to Lin-Manuel Miranda’s hip-hop-infused blockbuster, the Stone-Edwards musical about the struggle to achieve independence and forge a new nation now comes across as stodgy, old-fashioned and lacking in electricity. Co-directors Austin Pendleton and Kelli Edwards seem to be aware of that. Their nontraditional casting for “1776’’ — performers of color in roles that are usually played by white actors; women portraying men, and vice versa — suggests they’re hoping to capture some of the dynamism that “Hamilton’’ engendered by telling a story of the past with the diverse voices and faces of the present. It’s not enough, though. Pendleton and Edwards are unable to overcome the fundamental fustiness of a musical that is overly given to speechifying and so grievously under-supplied with memorable songs that you wonder how it won the Tony Award for best musical in 1969. Like another New Rep misfire, last December’s production of 1965’s “Man of La Mancha,’’ “1776’’ remains very much of its era in fundamental ways. Even when performed by a multiethnic, gender-bending cast, the show is hobbled by the fact that the default setting for any of its nearly two dozen characters is the same: Pose and declaim. Then pose again. Set largely in the chamber where the second Continental Congress has convened in Philadelphia during the sweltering summer of 1776, the musical revolves around the efforts by the fiery John Adams, played at full-throttle by the ever-reliable Benjamin Evett, to persuade delegates from the 13 Colonies to support a bid for independence from England. A large Union Jack, looming upstage on Cristina Todesco’s set, underscores the size of the challenge they will face in breaking free. After a Virginia delegate known for his eloquence named Thomas Jefferson (KP Powell) writes a Declaration of Independence, a battle erupts over a clause that denounces slavery. This jeopardizes the consensus Adams is trying to marshal, triggering a struggle between principle and cold political reality that leads to the most gripping section of “1776,’’ given added force by the production’s racially diverse casting. With so heavily populated a show and its focus so diffuse, it’s hard for an individual performer to stand out, but two manage to do so. Carolyn Saxon endows Abigail Adams with a playfully luminous personality that glows throughout her duets with Evett (“Till Then’’ and “Yours, Yours, Yours’’). Steven Martin, portraying a courier from Watertown (where the New Rep is located), delivers a spine-shivering rendition of “Momma Look Sharp,’’ a ballad sung by a mortally wounded young soldier whose mother is searching for him on the battlefield. As deeply moving as the song is, it’s never a good sign when the emotional depth of a musical number immediately makes you think that it belongs in another show.